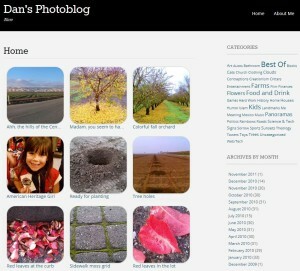 Have a nice blog template for your photoblog, but it’s not designed to provide a nice grid of your photos? Here’s how to make one that uses the Featured Image (a.k.a. “thumbnail”) from your latest posts. I wish I could find an easier way, but I have not yet. That’s it! Unless, of course, you want to tweak it. Then read on. First, it does not support pagination, so not sure how to allow user to go to older posts except through archive links in the second column. Second, I have not figured out how to use the shortcode in my archive templates, but that should be easy. I’ll ping the plugin creator for that. 1. Note that the shortcode does support various parameters, including post type, category ID, and more. 2. If you want your Archive pages to also have this format, you will need to edit your archive.php and/or category.php and try to make the shortcode work. I haven’t done this.